McIntosh full bloom was May 10-11 so on the early side of my prediction last week. 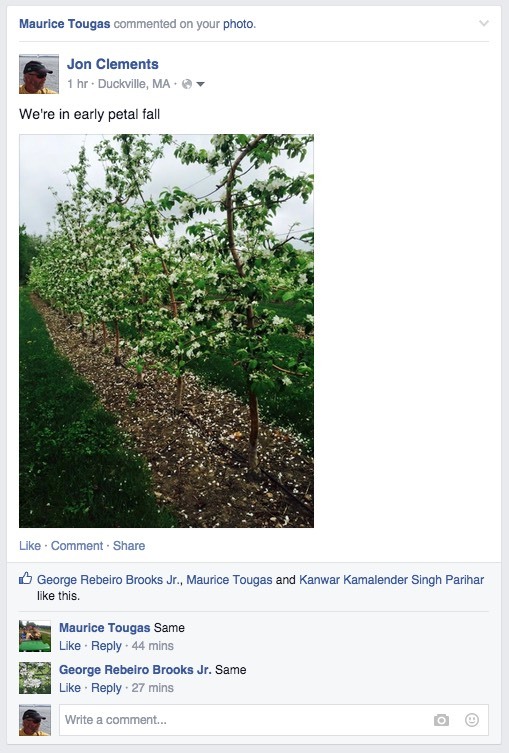 At the UMass Orchard, we are well into early petal fall and I suspect most petals will be on the ground by mid-week. Still no apple scab infection period to date. Not sure what is going to happen with wetting today, although an infection period is predicted. Avoid spraying during bloom, but if you need to cover up with fungicide, do it ASAP. It's going to be quite windy from here on out for the next 2-3 days. It looks to me like the significant opportunities for streptomycin application for fire blight were last Saturday and again today. Depending on your location, those two sprays should give pretty good protection for now. After today, a significant cool-down will completely lower the risk of fire blight. Beware of later infections when it warms up again if you have late blooming varieties or bloom on newly planted trees. Let's hope for a fire blight-free season! Oriental fruit moth were caught in pheromone traps in numbers yesterday. Mating disruption dispensers should be in place if you go that route, and a petal fall insecticide should be applied if you have historical problems with this pest in peach or apple. 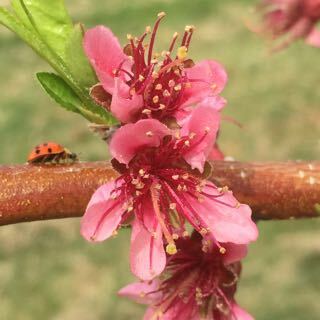 Speaking of petal fall, a carbaryl spray as soon as almost all the petals fall off (and the bees are out of the orchard) will help clean up any riff-raff out there in the orchard, including plum curculio. That will also start the chemical apple fruit thinning process. NAA (Fruitone-L), NAD (Amid-Thin) and 6-BA (Maxcel and others) are all alternative thinning chemicals that can start to be used at petal fall. Indications are that fruit set will be heavy, so our advice at this point is to thin early and often with whatever your material of choice. Carbaryl, NAD, and Maxcel are weaker thinners and safer bets if you don't know what is going on yet. Don't forget to look at the Apple Carbohydrate Thinning model on NEWA to help adjust your thinning rates and see how effective your thinning sprays might be. We'll update later as we see fruitlets setting (or not). It's time to start applying Apogee for growth control and enhancing fire blight resistance. Apply at petal fall, rate of 3-12 ounces per 100 gallons dilute TRV depending on size of trees, vigor of trees, and number of applications anticipated. If you have hard water, add a water conditioner or ammonium sulfate (AMS) per label directions, and a non-ionic surfactant is recommended to improve coverage and consistency of effect. Don't forget that Apogee typically makes it harder to thin apples off, adjust chemical thinning rates accordingly. Mark your agenda for fruit twilight meetings next Tuesday and Wednesday (May 19 and 20). They should be good! This has been a very unusual year for apple scab, for the third or fourth year in a row. The hot, dry weather going on two weeks has meant there has been no risk of scab infections. And by the weekend, petal fall will have happened in almost all of Massachusetts. 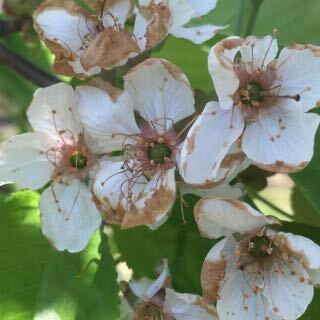 This week’s tests of apple scab ascospore maturity showed that there are still plenty of spores that will be released with the next wetting period. Spore release has continued to increase in the last three weeks (see details below). All of this indicates that with a significant wetting, many spores will be released, and if leaves stay wet for 6 to 8 hours, there will be very high risk of scab infection. Showers make the prediction of where wetting and scab infections may occur difficult. There has been no wetting in Belchertown since May 5, and that was not sufficient for scab infection. So far this season, we have had only one infection period early, and weather forecasts indicate relatively low chance of infection over the next week. On 5/11/15, we ran a petri plate assay with cut sections of 6 scabby leaves from the same outdoor collection for 2 hours and then examined the 2 slides. RESULTS: A total of 136 ascospores were seen during the examination of 20 microscope fields at 200 X magnification. We did not pull the microscope slide from the outdoor 2-fan spore trap because there has not been a significant rain event. On 5/11/15 we brought in a fresh batch of scabby leaves from the outdoor collection of scabby leaves (Belchertown). We wetted the leaves and placed them in the indoor funnel spore trap for 20 min. RESULTS: 201 ascospores were seen. This is a big increase from last week (last week we saw 61). On 5/11/15 we also performed squash mounts on 10 overwintered fruiting structures (pseudothecia) plucked from 6 leaves to evaluate maturation of ascal sacs and the spores they contain. RESULTS: all 10 pseudothecia had some ascal sacs that contained mature ascospores. The percentage of mature ascal sacs (versus immature) decreased from 90 % last week to 86%. The warm, dry weather means there’s plenty of fire bight inoculum available, but as long as it stays dry, blossom should not get infected. Dry is the key. Obviously, showers will trigger fire blight infections. But also watch out for heavy dews and sources of wetting other than actual rain. NEWA predictions for fire blight at CSO and in eastern MA continue to be extreme through today, May 12, though risk declines starting tonight with an influx of cooler weather. Risk is predicted to be low for the next two days before going back up on Friday. 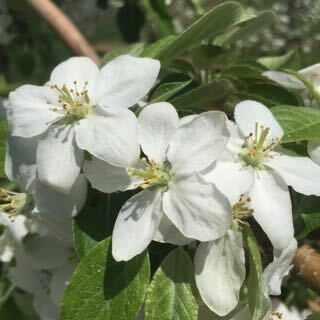 By Saturday, McIntosh at Belchertown is predicted to be at 100% petal fall, eliminating the risk of blossom blight for Macs. Petal fall is predicted a day or two earlier in eastern and more southern parts of the state. 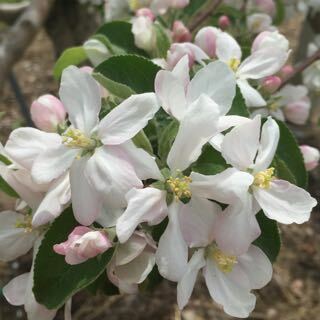 Still, late blooming cultivars and young trees may still be in bloom and may therefore require protection against fire blight into next week. 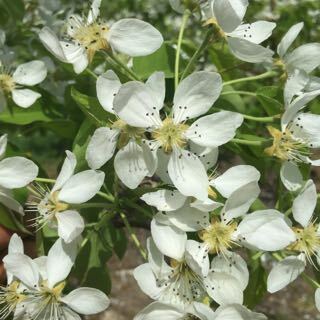 • Please read below for Duane Greene's brief assessment of the apple fruit set situation and what you might do for chemical thinning at petal fall. • But first I want to point you to this resource on Precision Crop Load Management for those of you up to it, it's from Cornell Cooperative Extension Eastern New York Commercial Horticulture Program. If you plant a Tall Spindle apple block you should not head the leader. Heading of the leader of a young apple tree after planting is undesirable as it removes a significant portion of the tree structure already produced in the nursery. Even if a whip is planted, the leader is not pruned or headed at planting for the Tall Spindle system. Instead of heading a whip, we recommend applying Maxcel (500ppm or 3.2 ounces/gallon) to stimulate branching of an “unheaded” whip so a more “calm tree” without much new upright growth can be grown as result of the heading cut. The Maxcel can be applied with a backpack sprayer using a single nozzle to the leader from the tip down to 24 inches above the soil at 10-15 days after bud break or with a spray tower. To improve branching even more you may combine the Maxcel treatment at 10-15 days after bud break with scoring (at bud swell) above every other bud along the leader from 24 to 45 inches high. Maxcel has also increased shoot growth of blind wood on two year old sections of leader of Granny Smith/M.26 and Fuji/M.9. Steve McArtney and JD Obermiller recently reported good results when Maxcel was applied for this purpose at 1500ppm (9.6 ounces/gallon) at the pink bud stage (a later timing!). Maxcel should be applied into the notch (and above the bud section) immediately after cutting. Don’t spray the tip of the leader with Maxcel in the orchard: I don’t recommend the use of Maxcel applied to the tip of the leader after planting. This application method is only recommended in the nursery for chemical branching. The bloom this year looks quite good in general with many varieties having a snowball bloom. There were no or few cold temperature events leading up to this time that would either weaken or damage flowers thus the bloom should be relatively strong. The weather forecast for the remainder of this week, Wednesday and beyond, is for somewhat sunny and cool conditions. This favors good fruit set and may make a more challenging situation for bloom and petal fall thinning. This is not a year when you want to wait to assess initial set before beginning your thinning program. Early thinning will give you the best chance of adequate return bloom and increased fruit size. Thinning at bloom or petal fall rarely, if ever, results in over thinning and there appears to be no special circumstances that would suggest it would happen this season. Carbaryl - This should not be applied at bloom because of toxicity to bees. It is a standard petal fall treatment that has been embraced by growers for many years. It is mild and safe when applied at petal fall. I am suggesting that it may be too weak as a stand-alone thinner on many varieties when used alone for conditions this year. It is frequently applied at 1 pint to 1 quart/ 100 gal of water. Amid-Thin (NAD) - For the past several years I have been using this thinner, primarily as a petal fall thinner. It has thinned adequately when used at 8 oz/100 gal, requiring just minimal touchup thing later. I encourage you to try some this year on a trial basis. Last year application of Amid-Thin at bloom was nearly as good as application at petal fall. Naphthaleneacetic acid (NAA) - This is a mainstream thinner that is effective when applied at bloom or petal fall. It has only half the thinning power when applied at bloom or petal fall than when it is applied at the 7 to 14 mm stage. Application rates of 10 ppm to 12 ppm are appropriate for bloom and petal fall on many varieties. Combination Spray - On difficult to thin varieties a combination of carbaryl plus NAA may be appropriate. Carbaryl at 1 pint to 1 quart per 100 gal with 10 to 12 ppm NAA is a suggested rate. MaxCel - Some areas are suggesting application of MaxCel at this time of year. I have experienced very little thinning when applied at this stage. There have been some reports of increased fruit size following application of MaxCel at this time. There appear to be no down side to application at this time other than the cost and the possibility of it now not being particularly effective. Promalin - This is a compound that was developed to increase typiness of Delicious. It does not thin appreciably when used at 1 pint per 100 gal but when used at 2 pints/100 gal, it can be a thinner. If used a bloom expect to see some elongation of the calyx end of fruit. The next Healthy Fruit will be published on Tuesday, May 19 or thereabouts, 2015. As always feel free to get in touch with any member of the UMass Fruit Team (http://extension.umass.edu/fruitadvisor/team-members) if you have questions or comments.